Here he is, ladies and gentlemen: A not-so-dumb jock. He was being honored for his work on behalf of the Andre Agassi Foundation. It has raised $75 million to date and used it to start a charter high school in a poor part of Las Vegas. He talked about this year's first graduation, in which seniors paraded across a special bridge and stopped halfway to show a sign to the underclassmen below, indicating which college they would be attending. Every senior in the school was accepted to a college. Agassi quoted one of the senior commencement speakers, who is now in a college pre-med program. 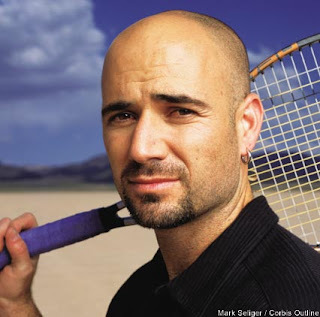 "She said that some who are short-sighted have labeled us as at-risk," Agassi said. "She said that was right. That we are at-risk. At risk of excellence." Bravo, Andre, for showing us how to play the second act.